Goal setting can help you reach your goals to achieve success in every area of your life. The beginning of the year is a great time to work on SMART goal setting, making resolutions, and filling out a goal setting worksheet. Of course, setting achievable goals for success and committing to a regular goal review can happen at any time of year, but is best if it is something you commit to doing regularly to keep yourself on track. The start of the New Year is a great time to work on goal setting. Commit to reviewing and re-assessing your yearly goals on a regular basis to achieve success in every area of your life! Goal setting can help you reach your goals to achieve success in every area of your life. I like to review and reassess my goals at the beginning of the New Year. Although I may get lazy about doing it… I never forget that it’s that time of year! The beginning of the year is a great time to make new resolutions, set goals, and fill out a goal setting worksheet. Of course, this goal review can happen at any time of year but is best if it is something you commit to doing regularly to keep yourself on track. Commit to your dreams by setting SMART achievable goals this year! In order to create new goals, you need to re-evaluate any prior goals or resolutions you may have made in the past. If you have a prior goal setting worksheet, now is the time to get it out for review. Do you have any goals that you are currently working toward? Have you written your goals down and created an action plan to complete them? If not, get started now! Do you have any prior goals that you would like to delete or amend? Are you making progress towards any of your goals in the way that you would like? Why or why not? Use this information to re-energize the goals you are still working towards. To help, check out this free new year resolutions & review printable from Modern Parent Messy Kids! To create new goals follow your dreams. What do you hope and wish for? What would you like to bring into your life, or what would you like to change? Why do you want these things for yourself or in your life? To help answer these questions I like to brainstorm what my wishes, dreams, and goals are in each area of my life. Feel free to add or subtract anything you’d like from this list of categories to make it your own. Four of the categories listed below can be condensed into one. Family, Motherhood/Fatherhood/Parenting, Marriage/Relationship, and Friendships can all be listed under Relationships if you prefer. Make your master goal list reflect your current life and values, or use it to create the life you’ve always dreamed of. Have fun with it by making your master goal list have a separate category for every current area of your life that is important to you. You can also include areas in your life that you would like to manifest or create. If for example, you are single and looking for a relationship, or married with the desire to start a family, or out of work and looking for a job, you can choose to create goal setting categories for these goals in order to achieve them. After you have decided on your personal goal setting categories, get out a pen and paper and write each one down on its own sheet of paper. You want to have plenty of room to work. Make sure you have plenty of room to write, scribble, doodle and get creative. 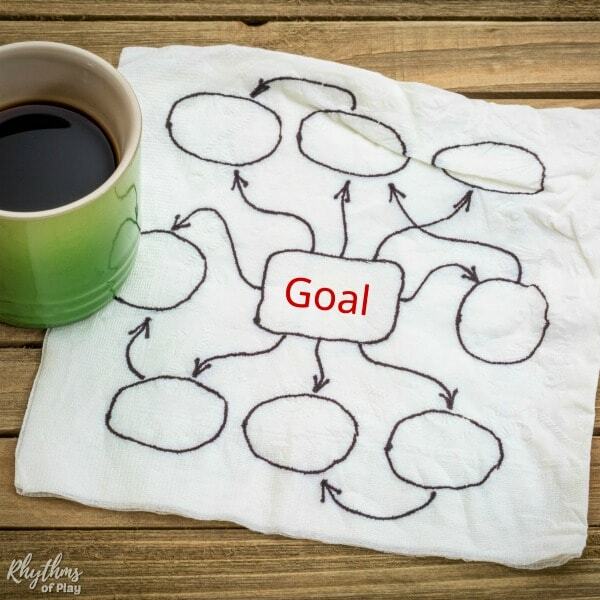 Some people like to put each goal setting category at the top of the page to make a list, while others like to put it in the middle of the page to make a mind map as shown in the photo below–use whatever technique works for you. This is not the time for fancy goal setting worksheets unless there is a mind-map printable that you like to use. The first stage of writing down goals is messy and imperfect. You want your subconscious mind to get involved in the co-creation of your goals. It is also not the time to pretend that you can work on goal setting in your head. Many people believe that the key to achieving your goals is writing them down. Don’t skip this first step or you will only be cheating yourself. This is your chance to let it all go, get it all out, and get messy! Don’t worry, we will be making a master goal list from the mess you create now in a later step. Begin by asking yourself questions about what you dream of or would like to achieve in each area. Don’t worry about logistics yet. We will be breaking these down into more manageable steps later. Focus on getting everything you can think of down on paper. Don’t worry if any of your goals look too lofty or overwhelming at the moment. Just keep writing. Get it all your goals, desires, and dreams down and out of your head. Projects you’ve always wanted to start, projects you’d like to complete. All of it… just keep writing, doodling, and letting your mind flow. When you are finished writing down everything you ever dreamed of doing or finishing… it’s time to start fine tuning all of your dreams, wishes, and projects into goals. 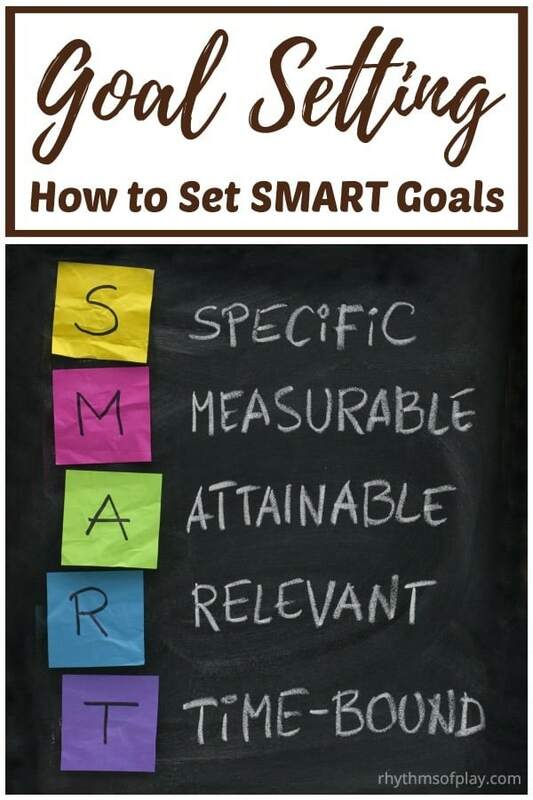 Begin with SMART goal setting–use the tips in the next section to get started. When you are finished writing down all of your goals, it is time to start fine-tuning them. Begin by making them SMART. The “SMART” acronym was originally coined 30 years ago by Peter Drucker in his classic work, Managing for Results . You cannot achieve what you don’t believe. 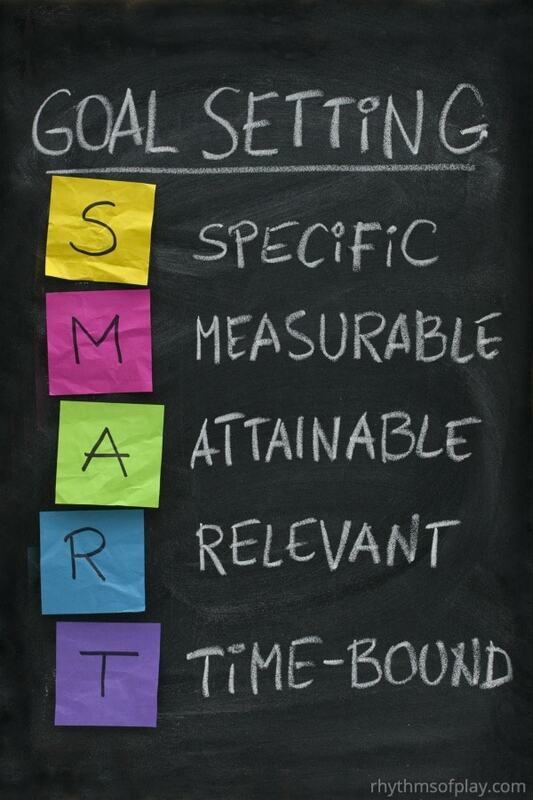 SMART Goal setting requires that you believe that you can accomplish the goals that you set for yourself. Setting goals that seem unattainable is a recipe for failure. You can not achieve what you do not believe. If there is a goal that you would like to achieve that seems unattainable, make one small step toward that goal your first goal towards that end goal. Once you reach that small step, make another small step your next goal. Continue to make baby steps you believe you can achieve your goal until the end goal is reached. Goals should be relevant to you and your current life situation. Does the attainment of this goal fit with your personality? Is this goal something you should be doing now or later? Does this goal add to your life in a positive way? Make all of your goals relevant and SMART by asking yourself these types of goal setting questions. Once you’ve worked on SMART Goal Setting and made all of your goals SMART, it’s time to create a master goal list! 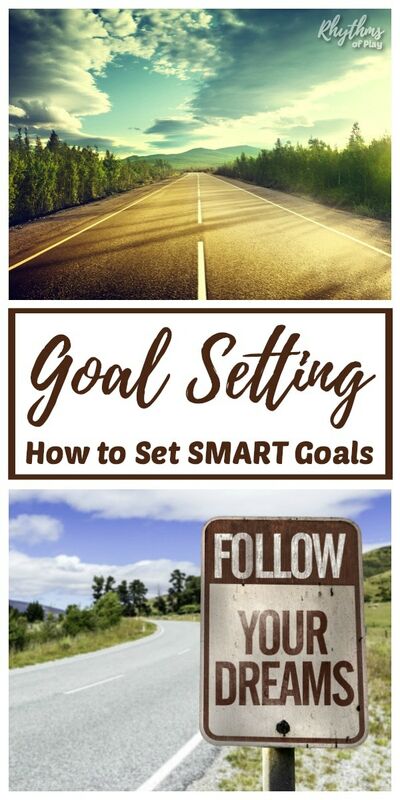 To do this, download our FREE goal setting worksheet pdf printable, take out a clean sheet of paper, or create a word document, to write down your top three goals in each area of your life. 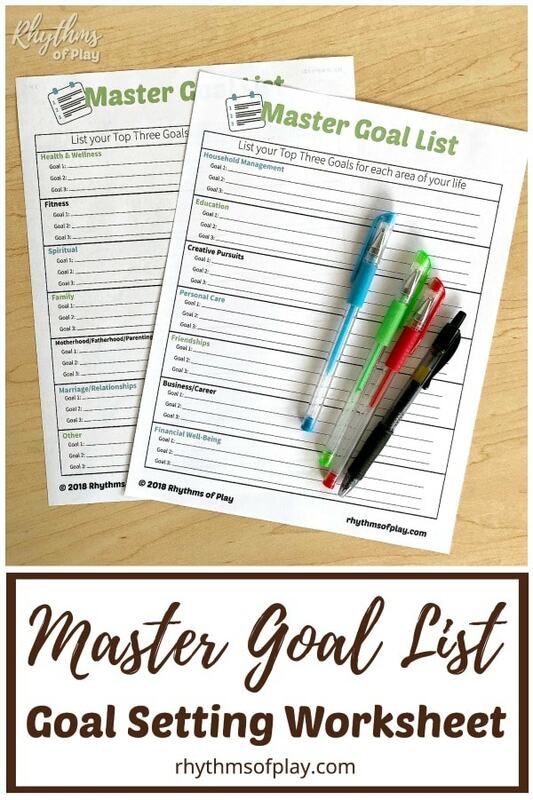 Examples of categories that you could use for your master goal list are listed on our goal setting worksheet printable master goal list and in section #2 above. Next, take out another sheet of paper, or create a new word document, and write down your top three goals from your Master Goal List. Use our handy-dandy goal setting worksheet to help narrow your focus and decide on the goals that you would like to work towards. Choose the top 3 goals that you want to work on attaining now. These are usually the ones that hold the most passion or are time sensitive in some way. Choose goals that balance and support each other. I am a firm believer in the idea that you can only give away what you first give yourself. Selecting a self-nurturing spiritual practice such as getting outside, bible study, yoga, meditation, or exercise as one of your goals builds balance and contributes to the successful completion of your other goals. Next, choose 2 more goals that balance and support each other. If, for example, I knew I would be moving during the year I would make moving one of my goals because it is both something that I have to accomplish and it is time sensitive. I’m going to move whether I’m ready or not so why not prepare for it by making it a goal? Last, I would choose the goal of getting organized, simplifying, or decluttering to support the move. Or, I could choose something business or career related in order to keep myself on track in that area of my life during the move. These goals would both support each other and keep my priorities in check. This type of goal setting will lead to success because you are making your goals even more achievable. Completing a master goal worksheet will jump-start your goal setting ability by providing you with a framework for success to achieve your goals. Once you have 3 goals that support and balance each other, put away your master list until your next monthly goal review. You did it! You have three shiny new goals all set to accomplish. Congratulations, to a SMART goal setting job well done! Many people say that the key to attaining your goals is writing them down. Kudos to you. You’re halfway to living the life of your dreams! Learn the next action steps to help you attain your goals in How to make an action plan to accomplish goals. Learn more about Rhythms of Play HERE! These are some fantastic goals and I love the way you’ve set them out. Very motivating.